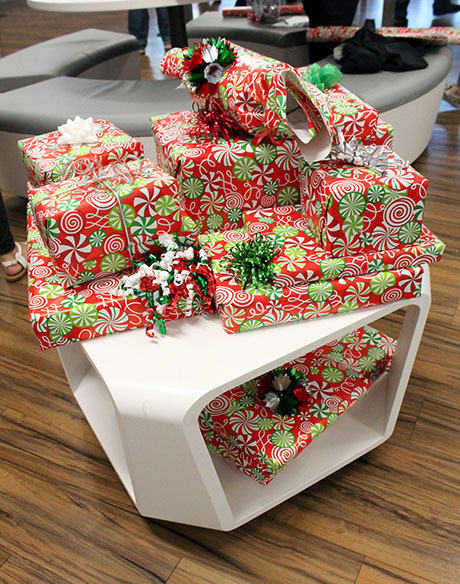 It’s early afternoon in downtown Phoenix, and on the 12th floor of the Collier Center, Christmas has come early. Piles of toys, clothes and cookware lay scattered across three rows of long white tables. Christmas music plays over a speaker as men and women swiftly wrap items in brightly colored wrapping paper, crossing names off a list as they go. “Make sure you mark that one for the little girl,” a woman instructs, as a freshly wrapped gift is added to the growing pile of presents. Across the room a pair of women inspect an oddly shaped gift. “How are we going to wrap this?” One woman asks another. The two laugh as they grab wrapping paper, ready to get to work. 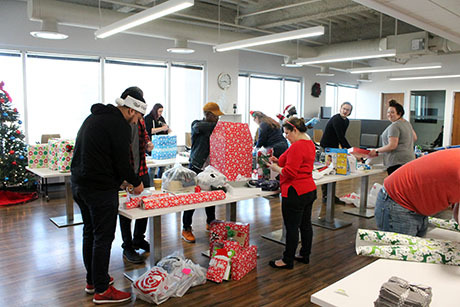 The mounds of presents that lay across the tables are united by one common thread: an Uber employee purchased each gift for a family in need. 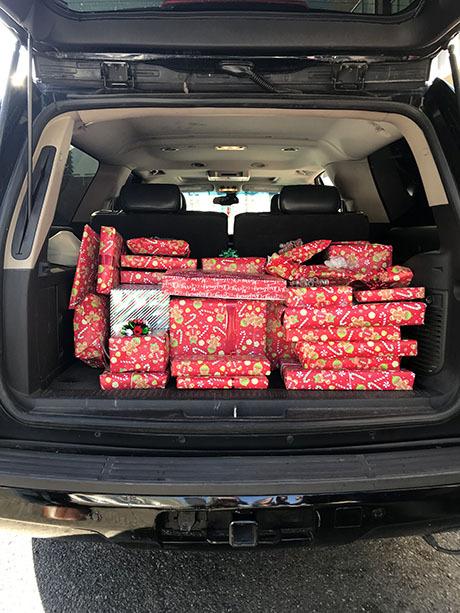 During the holiday season, the ridesharing company is not just delivering rides, but also delivering holiday cheer by participating in St. Vincent de Paul’s Adopt-A-Family Christmas program. This program allows individuals, families and businesses to “adopt” families in need. Working-poor parents often find that Christmas is an especially stressful time because they may not be able to provide presents for their children. The program relieves that stress by pairing them up with a donor family or business that hopes to share the holiday spirit by providing gifts and fixings for a Christmas meal. St. Vincent de Paul’s conferences interview the families who want to be adopted in order to gather information and assess their needs. Sponsors then provide the food and gifts for the participating families. 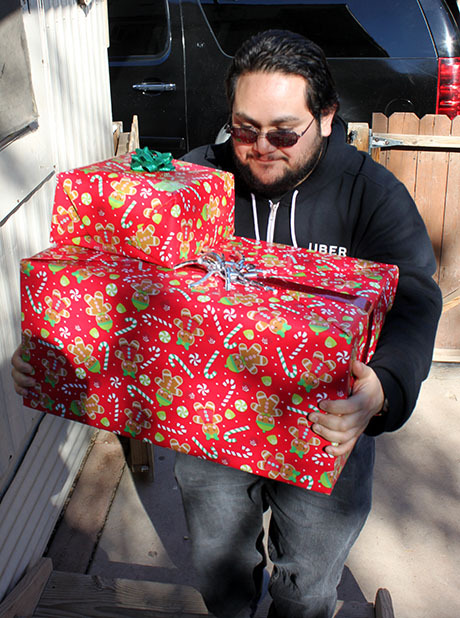 This year, Uber adopted seven families through the program. 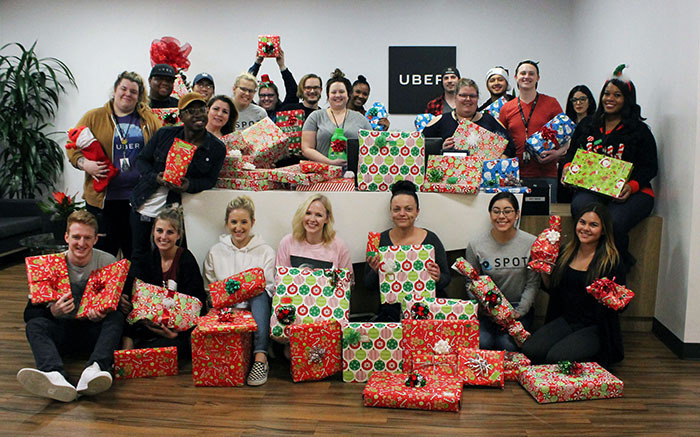 Between purchasing, collecting, wrapping and delivering the gifts, over 200 Uber employees participated in St. Vincent de Paul’s Adopt-A-Family Christmas program. With the wrapping completed and the presents divided, it was time to share these gifts with the families that needed them. Large SUVs, or Uber “sleighs”, were filled to the brim with the gifts. The first stop of the day was just a short drive away. 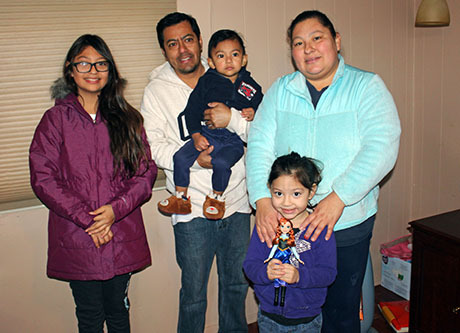 A palpable feeling of excitement clung to the air as the Torres Family’s home appeared. There, in front of their house, was the family of five waiting to greet their Christmas sponsors. With welcoming smiles and open doors the sleighs were unloaded. 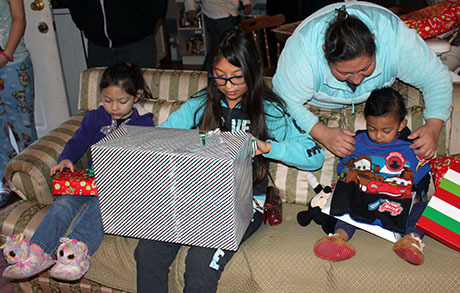 Each member of the family opened a single present that day, saving the rest for Christmas. Hugs, tears and laughter were exchanged, along with heartfelt Thanks. Last year, over 700 local families were adopted through St. Vincent de Paul’s program. Sponsoring a family is a wonderful way to spread joy and keep to the true spirit of Christmas. Every day, we serve hundreds of struggling families who are working hard to make a better life for their children. The community support that programs like Adopt-A-Family receive make it possible for St. Vincent de Paul to spread joy not just during the Christmas season, but all year long.